Directed by Mike Newell I actually quite liked The Awakening despite the stick it seems to get. The script by Chris Bryant, Clive Exton & Allan Scott based on the Bram Stoker novel ‘The Jewel of Seven Stars’ is intricate & you need to have patience to get the most out of it. If you want CGI mummy’s & explosions every couple of minutes then The Awakening is definitely not the film for you, stick with Stephen Sommers The Mummy (1999) & it’s sequel The Mummy Returns (2001) both of which I throughly like by the way. This is basically the same film as Hammer’s Blood from the Mummy’s Tomb (1971) which I thought was crap & I much prefer this take on Stoker’s novel. The biggest problem I had with The Awakening, & the one most of it’s detractor’s seem to have, is that when the film returns to ‘The Present’ it is just too slow, it desperately either needed a couple more killings to liven things up a bit or to be edited down by five or ten minutes to quicken the pace. There is no mummy walking around in bandages so don’t expect any of that sort of thing, the core storyline of The Awakening relies on a supernatural angle & possession rather than a guy in bandages. 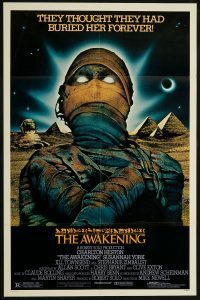 I think The Awakening is a very handsome film with real Egyptian location filming, in fact it’s probably the only mummy film ever to be actually shot in Egypt! The cinematography by Oscar winner Jack Cardiff is as accomplished as you would expect. The sets especially Queen Kara’s tomb, the Egyptian artifacts & general production design credited to Micheal Stringer are excellent throughout. I thought director Newell managed to create some good scenes & have an overall foreboding atmosphere for most of the film. There isn’t much in the way of blood or gore but there is a really cool scene when a slither of glass falls from a broken window & impales someones throat, ouch! The acting is pretty good, well I thought so anyway. I liked The Awakening despite the fact everyone else seem to hate it, sure it’s slow but I found it quite involving as well & was a nice change of pace without ever threatening to put me to sleep. I’m not sure I can recommend The Awakening as it would probably put most people into a coma but what the hell, I liked it & that’s all that really matters to me.